The Nobel Peace Prize, awarded this year to Barack Obama, is represented by a medal with the face of Alfred Nobel, with a group of three men forming a fraternal bond on the other side. On 27 November 1895, Alfred Nobel signed his last will and testament, giving the largest share of his fortune to a series of prizes, the Nobel Prizes. As described in Nobel’s will, one part was dedicated to “the person who shall have done the most or the best work for fraternity between nations, for the abolition or reduction of standing armies and for the holding and promotion of peace congresses”. The inscription reads: Pro pace et fraternitate gentium”, translated “For the peace and brotherhood of men”. “Prix Nobel de la Paix”, the relevant year, and the name of the Nobel Peace Prize Laureate is engraved on the edge of the medal. 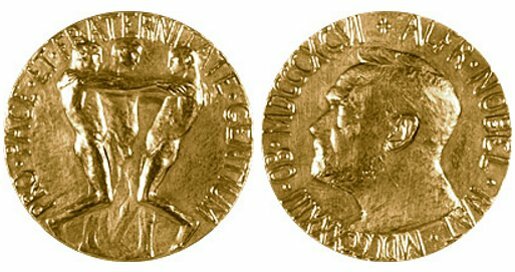 The Nobel Peace Prize Medal was designed by Norwegian sculptor Gustav Vigeland.